I wonder if anyone can advise the best way to compare parts in one set vs those in another? This would be great when I am trying to build an old set from parts to assess whether buying a currently available set would provide a certain % of the parts needed. Might make sets on sale worth buying for this purpose rather than to build in their own right. 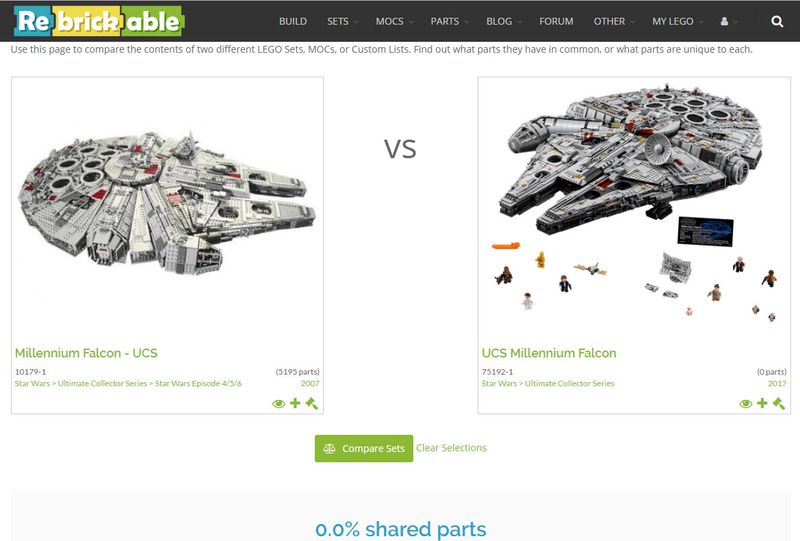 Check out rebrickable.com. You can create a list of sets and it will provide a list of sets (and MOCs) you can build from the parts. It also can provide lists of parts you need to complete a selected set and recommend sets that have those parts. Yes, and better still if you have your collection recorded here you can export it to Rebrickable and keep them in sync. I own wonderfully- lots of fun. Perfect!! - Thanks guys the compare sets option was exactly what I was looking for. I was aware of the site but thought it was more for looking at my collection and seeing what I could build from it. Whereas I'm looking at buying a specific set to help with the build of an old set and wanted to see which parts are shared across the two. That cannot be right. Note that it states #75192 has 0 parts. They probably won't upload the inventory until 1st Oct. The bricklink inventory is currently under review.